MORE than 3,000 council workers walked out on strike yesterday (Wednesday) in a row over pay. The 48-hour action closed or partially closed 16 libraries and 18 schools, disrupted rubbish collections and many other Town Hall services. The public sector workers’ union Unison is calling for Camden Council to meet its demands for a pay increase in line with inflation. Picket lines across Camden were “solid”, according to striking workers who later joined a London-wide demonstration in Lincoln’s Inn Fields and a rally in Friends House, Euston. They are threatening further strikes if a 6 per cent pay increase, or 50 pence an hour rise, is not met. 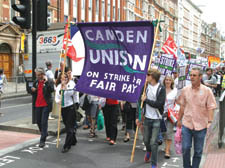 Camden is offering 2.45 per cent, in line with a government benchmark for public sector pay. Inflation officially reached the 3.8 per cent mark yesterday, with the rising food and fuel prices putting added pressure on the cost of living.